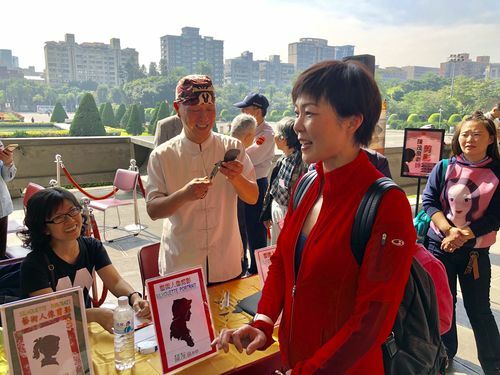 A traditional Chinese calligraphy couplet event featuring over 100 calligraphers was held at the National Sun Yat-sen Memorial Hall (NSYSMH) in Taipei Jan. 19, 2019 to welcome the arrival of the Chinese New Year. NSYSMH Director-General Liang Yung-fei (梁永斐, third right), Deputy Culture Minister Hsiao Tsung-huang (蕭宗煌, second right) and opposition Kuomintang Legislator Fai Hrong-tai (費鴻泰, left) pose with their calligraphy at the event. 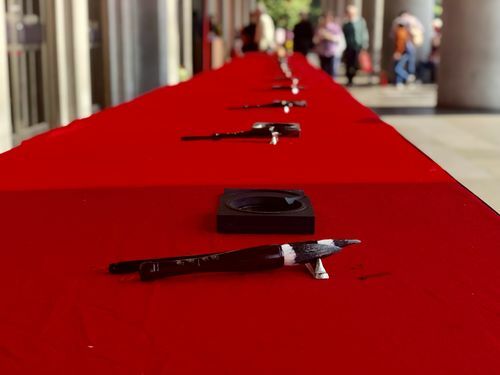 The event, which has been held annually for over 30 years, has invited 108 calligraphers and 70 guests. 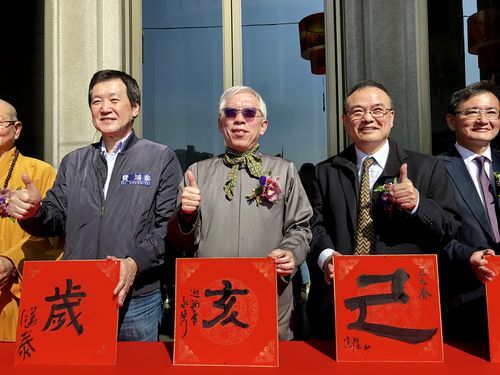 Taiwanese entertainer Mickey Huang (黃子佼, center) poses with his calligraphy of the character "grand". 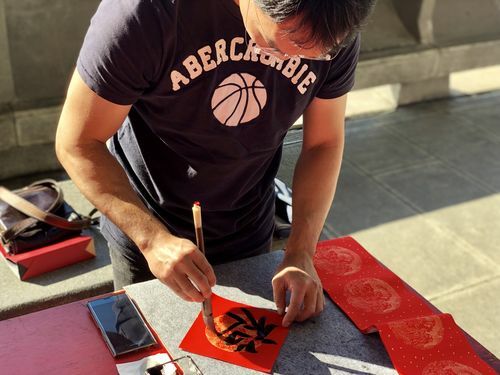 Chen Hsin-lang (陳信郎), a calligrapher from an association that promotes Chinese calligraphy learning for children, writes the Chinese character for "fortune". Chen said people like to turn the character upside-down when they place it on their walls or doors because the character for "upside-down" is a homonym for the character for "to arrive," hence meaning that good fortune has arrived. 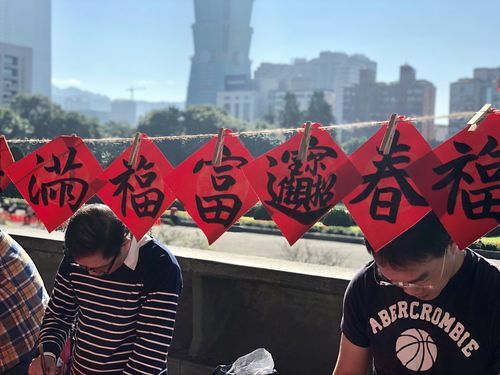 Auspicious words reflecting the festive cheer of the upcoming Lunar New Year, hang to dry before they are given to visitors at the event. 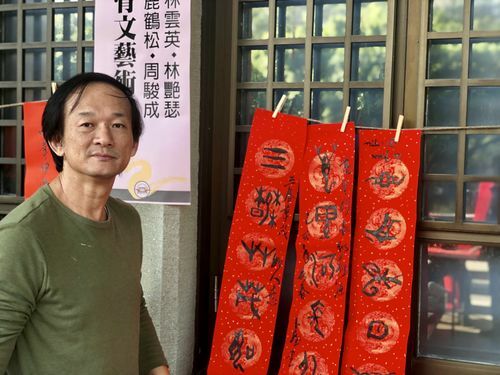 Lu Hong-sung (鹿鶴松), a calligrapher from an association that promotes oracle bone script, poses with his works. The couplets are written by Lu in oracle bone script, the earliest known form of Chinese writing. 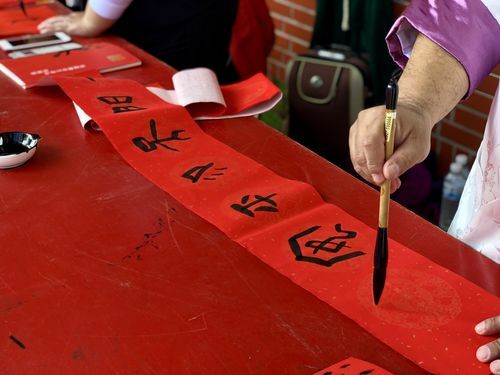 Lu said oracle bone script was in use approximately 3,300 years ago during the Shang Dynasty. The script has over 5,000 characters, around 2,000 of which have been decoded. Feng Shih-peng (馮士彭), deputy head of the Chinese Taipei Painting and Calligraphy Institute of Art, writes an auspicious couplet. 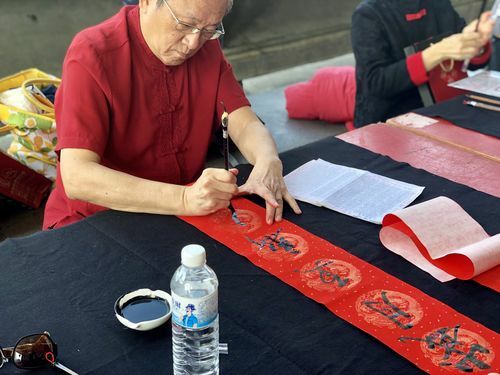 Feng said the words portray the meaning that even though a year has gone by, the people have not aged, which represents the auspiciousness of youth. Paper cutting master Chen Mao-chuan (陳茂泉, second left) cuts a silhouette portrait for a visitor from Australia. The event also lined up a number of other activities and performances. 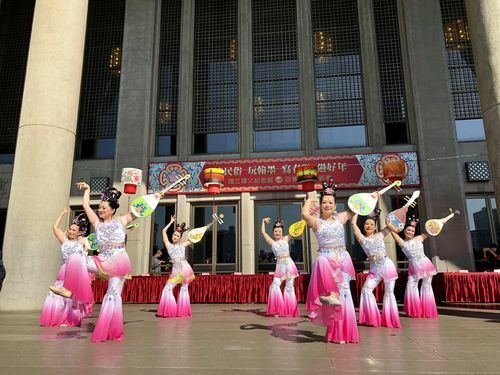 A traditional Dunhuang dance group from Keelung Community University performs at the event. The dance group showcased the pipa, a classical Chinese musical instrument, in their performance. 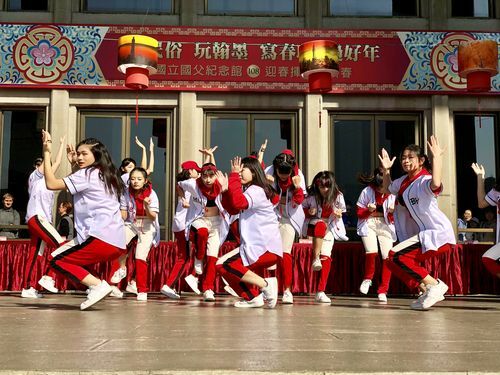 A dance group from Taipei First Girls High School perform a hip hop dance at the event. 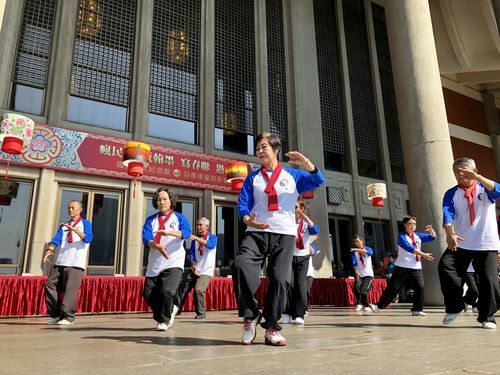 Members of the local community near NSYSMH perform a tai chi demonstration. 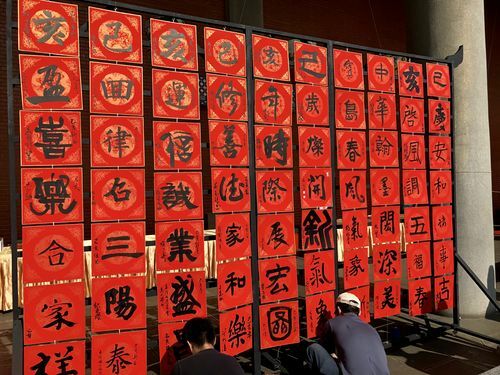 The event featured auspicious words and phrases believed to bring good fortune with the arrival of the Lunar New Year.